In this section we cover how Microsoft push notifications work, when to use notifications, and how to add push notifications to your application. First we start with an overview of how Microsoft push Notifications work. 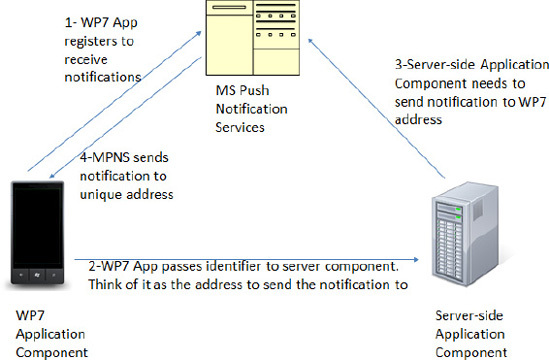 Microsoft Push Notification Services (MPNS) provides a facility to connect your Windows Phone 7 application to the server without requiring continuous polling by the application. Polling works and is functional, but if an application is continuously polling and the server response is "nothing to download," the application is potentially consuming battery without any user benefit. Push notifications are not a new concept in the industry. Other platforms include push notification services as well. Another challenge with polling is that Windows Phone 7 does not support multitasking for third-party applications running on the device. Therefore, for an application to poll for data it must remain in the foreground as the active application. While not letting any third-party application to drain the battery polling for data in the background helps to enhance the end-user experience, applications still need to be able to react to application data and status changes even when not running. Microsoft Push Notification Services raw push notifications sends the actual data to the application. You can use raw notifications in addition to tile and toast notifications to send information directly to your application. It can be up to 1kb in size. The idea is to send a toast that something has happened and then send a raw notification to the application so that it can display the corresponding data when the application is launched. Microsoft Push Notification Services allows an application to receive notifications that data has been updated or application status has changed even when the application is not running. When a toast notification is received, the user receives a "toast," which is a little pop-up across the top of the screen that the user can click on, resulting in launching your application. Figure 1 shows a sample toast notification from the MSDN documentation. The toast notification is system generated. It displays over any application running, whether the Start screen or running application. If the application that expects to receive the notification is running, the toast notification is not displayed, but because the application is already running, the application simply processes and displays the data directly. An important user experience consideration is to use toast notifications sparingly and with flexible configuration settings to help the user tune which notifications they are interested in receiving. The reason why is because toast notifications are disruptive, appearing over top any running application, even an action game. First party applications such as the phone dialer and other built-in applications can multitask with a running third-party application, as well as with other first-party applications. 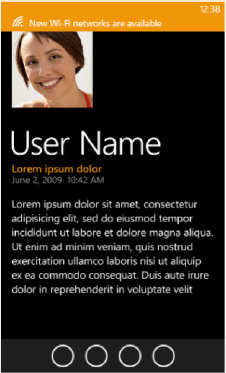 Another type of notification is a tile notification, which updates the application tile if, and only if, the user decided to pin your application's tile to the Windows Phone 7 Start screen. Tile notifications can consist of a value for the tile Title value, a Count value (between 1 and 99), as well as a 173 × 173 background image for the tile. There are not any additional customizations available but with a little bit of server-side work your application can dynamically generate custom images for the tile background. For MPNS to work by sending important data to the user's phone, it implies some sort of server-side component to the Windows Phone 7 application receiving the notification, which is correct. Essentially MPNS is a proxy between the server-side component of your solution and the Windows Phone 7 application component. Figure 2 provides a graphical representation of how MPNS works. 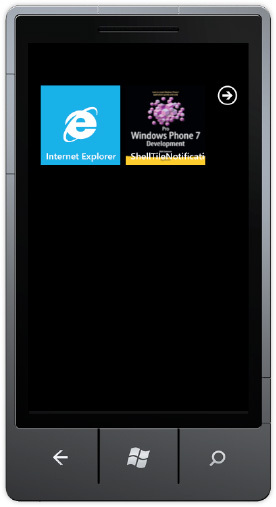 The user via their Windows Phone 7 phone initiates the request to MPNS. MPNS receives the request and passes a URI back to the application. The application then passes the URI to the server-side application component along with information on which notifications the user would like to receive such as scores for their favorite sports team. The server-side component now has all the information it needs, the "address" to send the notification to via MPNS as well as the criteria the user has chosen for what notifications the user would like to receive. Receive registration requests and subscription criteria (i.e., send me a notification for breaking news regarding my favorite sports team) from the Windows Phone 7 application. Perform subscription matching and then send push notification requests to MPNS. For this section, I want to focus on the Windows Push Notification Server Side Helper Library created by the Microsoft evangelism team to assist developers quickly implement push notification services. The library supports sending all three push notification messages available, specifically Raw, Tile, and Toast. The library abstracts out the complexity of implementing push notifications to just a few lines of code for your application. The sample code included with the download provides a very powerful example of how to work with the library it includes a "server" application as a Windows Presentation Foundation client. A real application could be a Windows Service or similar construct on other platforms. What's great about the sample is that it demonstrates a dialog between the client and the server. For example, the client keeps the server aware of whether the user has pinned the application tile. Once the user has pinned the tile the server-side application is made aware and prepares to send tile updates. Even just switching tabs on the server-side WPF application results in UI updates via RAW notifications on the WP7 application. Run the sample to see it in action. Microsoft has done research that indicates end-users like applications that support live tiles. It promotes "at a glance" information delivery, such as when the Outlook tile indicates the number of unread messages. As mentioned in the previous section, Microsoft Push Notification Services provides fine-grained control over tile updates for maximum personalization. There are situations where an ISV develops an application that doesn't need full push notification functionality but the ISV would still like to support tile updates. Windows Phone 7 provides a client-side pull API that allows an application to update its pinned tile on a pre-defined basis of every hour, every day, or every week. No other update schedule is available. Delivery times will vary within the specified schedule meaning if an application registers for a tile update on a daily basis, the tile update can happen at any time within that time period. Still, this can provide a simple way to add a Live Tile to an application. The API that provides this functionality is the Microsoft.Phone.Shell.ShellTileSchedule API. The API takes a URI to a web service or image located on a web site as well as an interval setting. Listing 1 shows the code. //can be Started and Stopped. Create a private variable for the ShellTileSchedule instance so that you can stop it at a later time if the user decides for some reason to want to turn off Live Tile updates. In this example, two application bar buttons titled start and stop control the schedule. Once the tile is pinned it can take up the full interval time before it is updated. Tile updates do not occur if the phone is in an idle state, meaning the screen is off or the lock screen is visible. As soon as the screen is on and unlocked the tile will update. Figure 3 shows the updated tile. The image at the URI must be less than 80KB in size with a maximum download time of 15 seconds. If the API cannot download the image within 15 seconds three consecutive times the schedule will be removed. You can have more than one ShellTileSchedule available in your application, although only one schedule can be active at a time. As an example, let's say you are building an application that provides news coverage for all 32 NFL football teams. You could create 32 URIs that are updated with team specific content and present a menu to the user that says something like "which team would you like to get live tile updates for?" Once the user selects a team, create the corresponding ShellTileSchedule to that team's URI, and voila! Customized live tile updates with just a few lines of code.